A monarch poised on milkweed. Photo by Debbie Foster. Bright, colorful, and winged, butterflies flit through our yards, lifting our spirit and brightening our day. What if I told you that you could actively attract butterflies to your yard, increasing the number and variety? It’s easy! All you have to know is what the butterfly wants – where it will lay its eggs and what it will eat. For example, Monarchs only lay their eggs on one kind of plant, and they need the same plant to lay their eggs. What is this plant? Milkweed, aka Asclepias spp. Milkweed contains glycoside toxins, which aren’t harmful to the caterpillars but are to their predators. 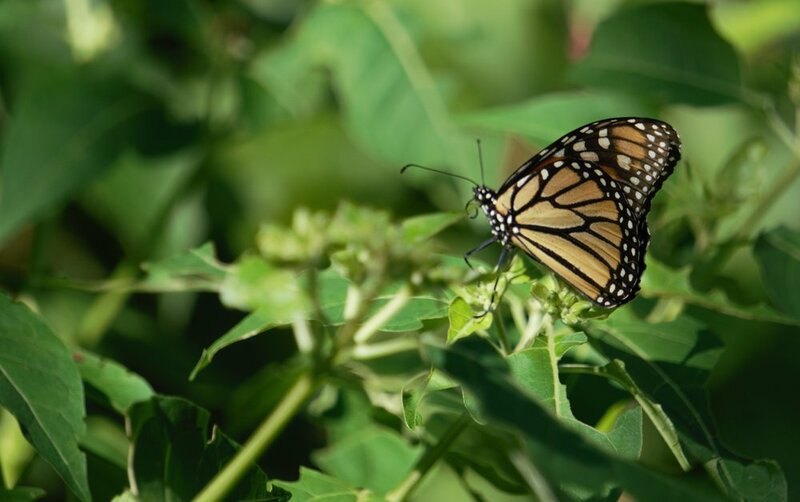 Here’s an amazing fact – those toxins remain throughout metamorphosis, making the adult Monarch toxic to its predators! Even more amazing, these butterflies have a two-way migration just like birds, although it will take several generations. They can fly 50-100 miles a day! If you want to see monarchs migrating, head up to the Blue Ridge Parkway in September and early October. Here are some locations where they are commonly seen, according to Romantic Asheville. Spicebush swallowtail butterfly on a Mexican torch sunflower. Photo by Renee Garner. Another butterfly you could attract to your yard is the Spicebush Swallowtail. Planting spicebush provides a host plant for these beautiful flutterbies, as well as food The caterpillars have a fascinating behavior of wrapping themselves in the leaves of the plant to avoid being eaten by hungry birds. Finally, let’s look at the Eastern Tiger Swallowtail, one of our most common butterflies in this area. It’s easy to attract these guys. Just plant parsley, fennel, and dill. Make sure you plant enough so that you have some to cook with and the “cats” have something to eat. One last tip for attracting butterflies – be a messy gardener! Some butterflies overwinter in leaf litter and other garden debris, so don’t be in a hurry to do fall and winter cleanup. Male eastern tiger swallowtail butterfly. Photo by Debbie Foster.